Heather's Odyssey has been awarded The Silver Lining blog award by fellow writer and blogger Anne Riley! I'm so honored, but I don't have a speech prepared! I'm a writer not a spur of the moment kind of gal. 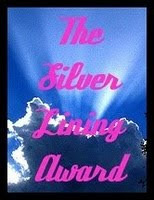 The Silver Lining award is given to blogs that help others in some way or focus on the good things in life to uplift others, or so I understand it. To know that I have helped others or brightened their day enough to earn an award for it makes me feel amazing. That's what Heather's Odyssey is all about, making the journey to publication easier-or at least less mystifying-for other writers. To know I have accomplished that for at least one person makes every entry I've ever written worth it. Thank you Anne! Of course I had to hand the award back to Anne Riley because I love her blog and it has definitely made me see the silver lining in life more than once! However, since she already passed it on to five wonderful blogs, I absolve her from the responsibility of passing it on again. You so deserve this award! I find your insights and posts about the publishing industry very helpful! And thanks SO MUCH for passing it on to me... I am now thinking about who to pass on from myself. :) I appreciate all your support, Heather! Hope you have an awesome week of writing! YaY!!! Your blog is great, you definitely deserve this reward! !